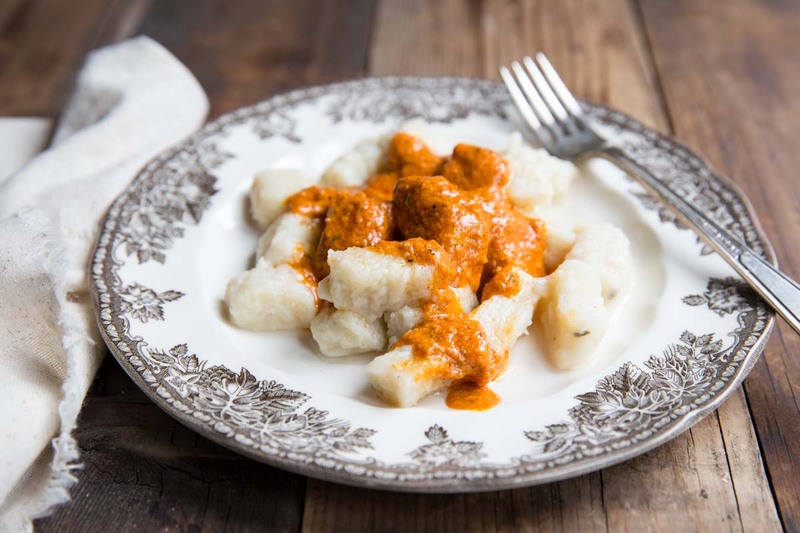 While just about any sauce suites these homemade potato gnocchi just fine, our latest favorite is this Spanish Romesco Sauce I posted about previously. Gnocchi is something we’ve been making in our home for guests for years, probably one of the first more intricate things we ventured to make. 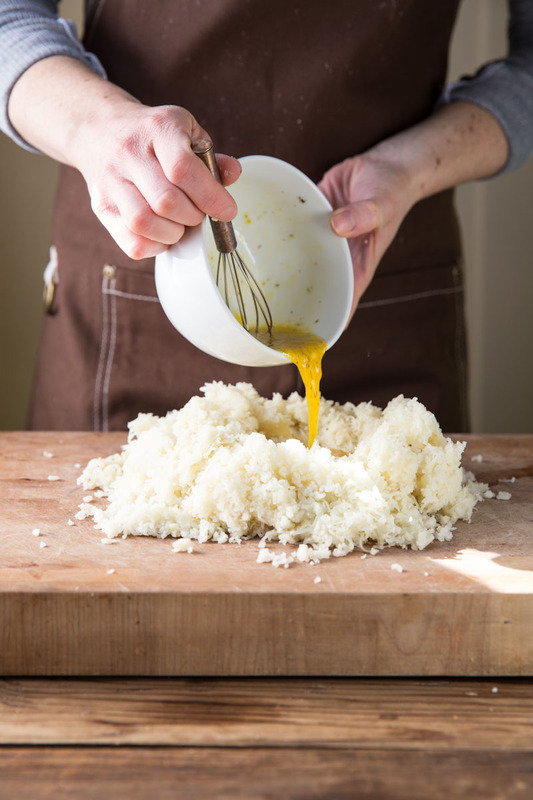 Not only is it pretty simple to master but it makes for an incredibly comforting meal. 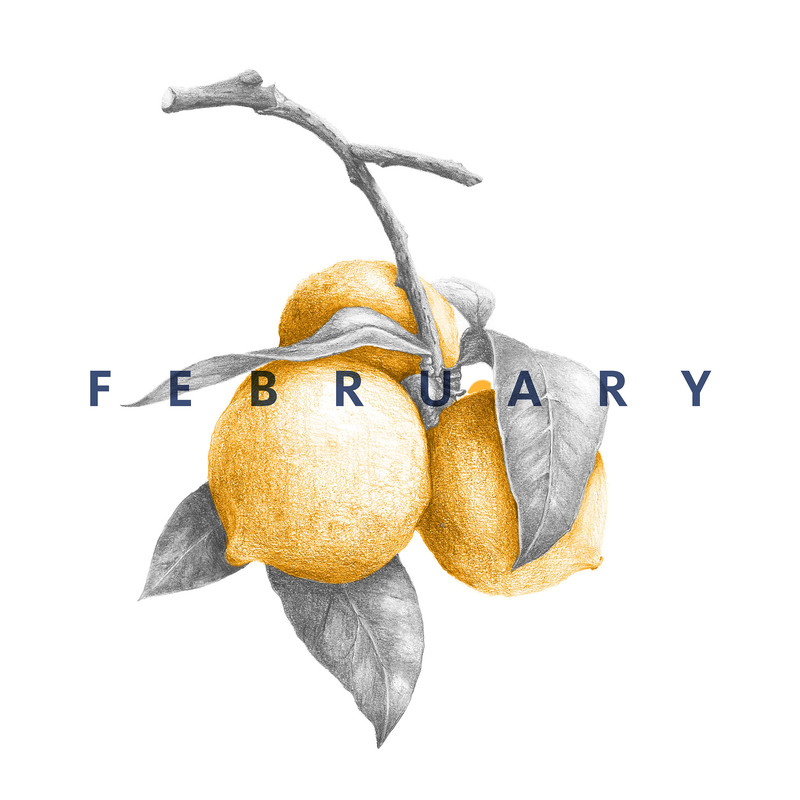 The food you see on this blog is food I feed my family. It’s what were having for dinner and in this case, what we’ve been having for dinner and serving guests for years. It never goes to waste and leftovers are always enjoyed (with few exceptions). This may seem obvious to some but I thought maybe some readers might be curious. 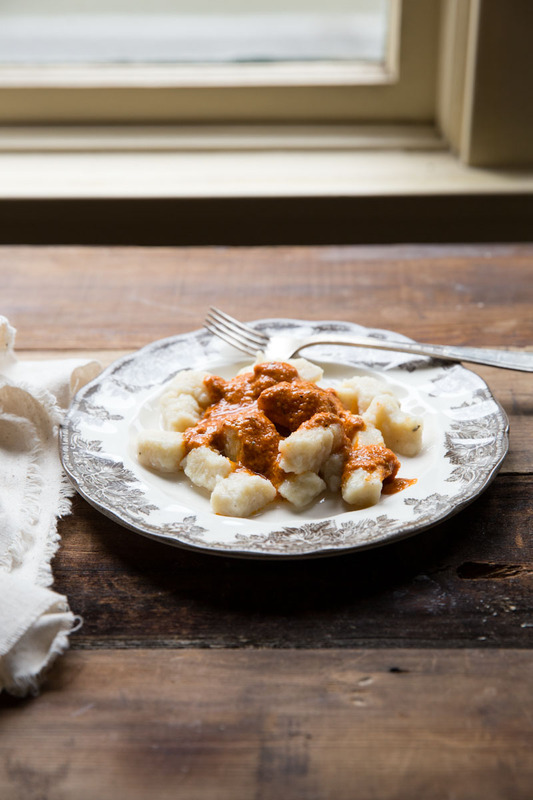 On this occasion… the gnocchi was enjoyed the night we made it with Romesco sauce just for our family of three and then we enjoyed it again again, as I froze half, with a pesto cream sauce as we had friends over for dinner. I often photograph the food right before it’s eaten… and though I love the process of photographing and naturally styling food, this part often gets rushed. I often first think of those whom I’m feeding and I want them to get the first warm bite instead of capturing the best photo. This often leaves me in a dilemma. Lately, I’ve found a better balance to prepare some food earlier in the day, take my time photographing then rewarm in the oven or a skillet for dinner. Less rushed, more peace at dinner time… this is my hope. Today, I took some extra time to go through the process of making gnocchi with you step by step. So, grab some potatoes and meet me in the kitchen! First, you want to take your slightly cooled baked potatoes and remove the skins. You can do this by taking a spoon and spooning out the potato or by using a peeler. You may need gloves if your hands are sensitive to heat. Discard the skins and place the potato in a large bowl. 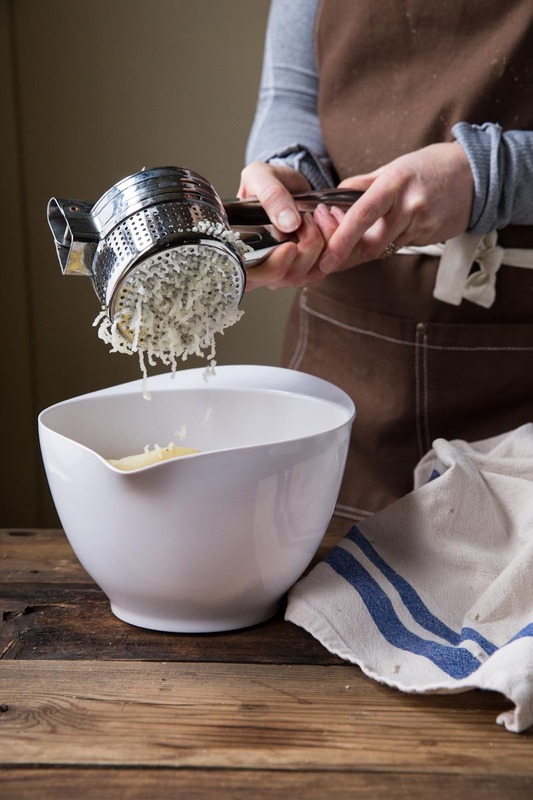 Using a potato ricer, or a cheese grater, rice/grate the potato into finer bits. Set this aside to continue to cool. In a separate bowl whisk the egg with seasonings. 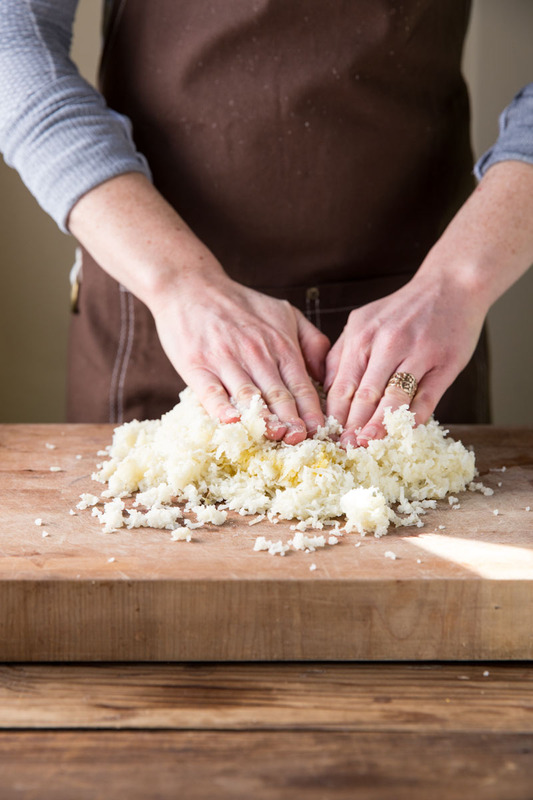 Dump out the riced potato onto a lightly floured wooden cutting board. Make a well in the center of the potato and pour the egg mixture inside. 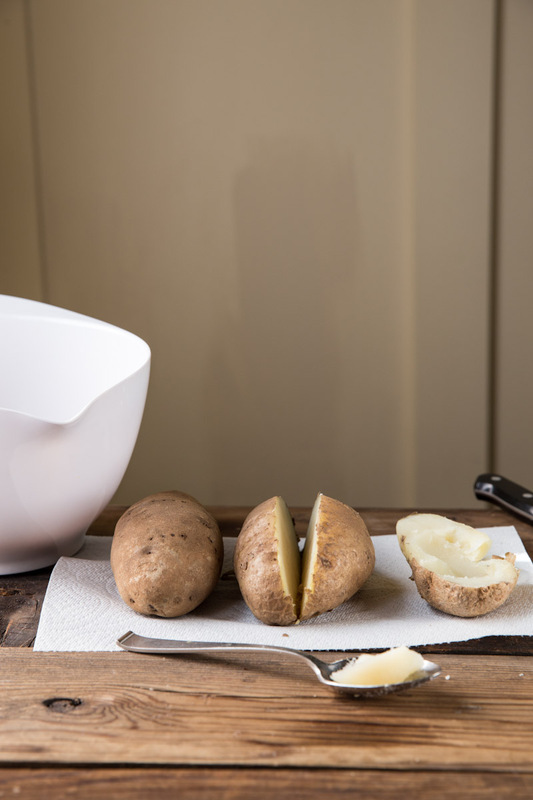 Fold the egg mixture into the potato by gently lifting the sides of the potato and pressing them into the egg mixture. Gradually add the flour and cheese to the gnocchi dough and knead the dough (this should only take about 3-5 minutes). The dough should be smooth but slightly sticky. Or if you forget the cheese you can gently add it after, like I did. 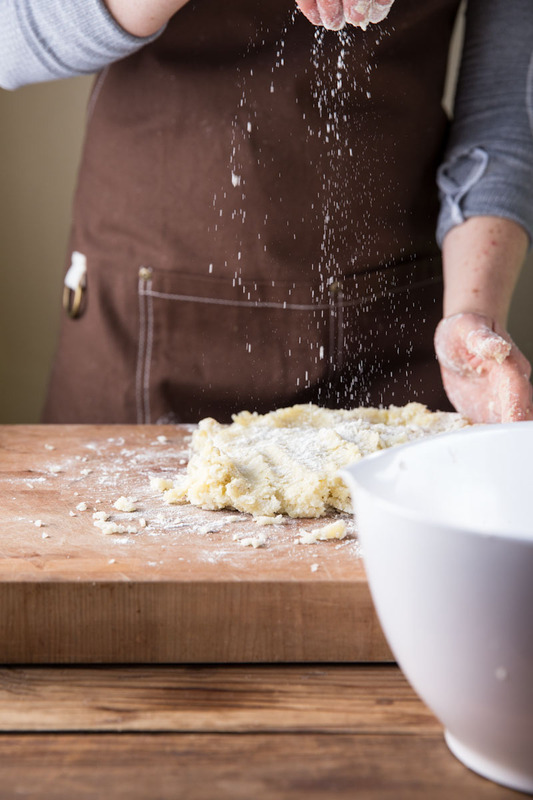 Try to not overwork the dough, which will lead to a more dense gnocchi. Separate the dough into 6 balls. 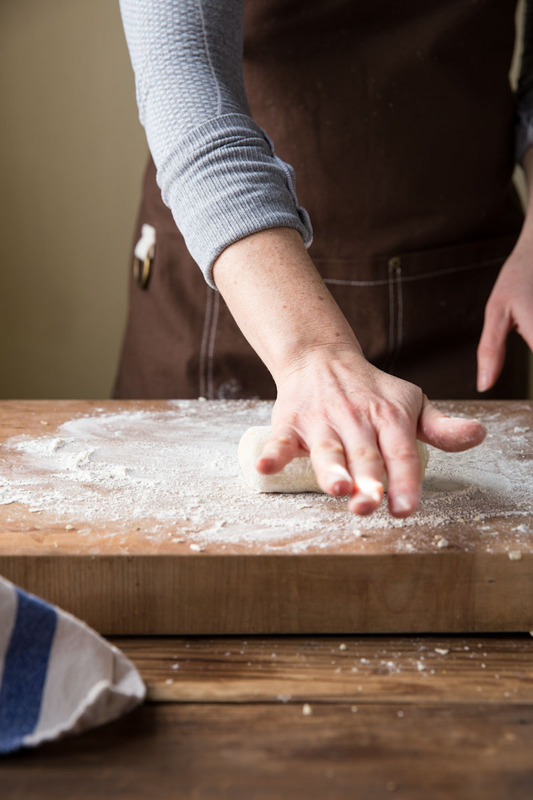 Re flour your surface and roll out each individual ball into a long rope, 1/2 inch thick. Slice the long strand into 1/2 inch pieces. 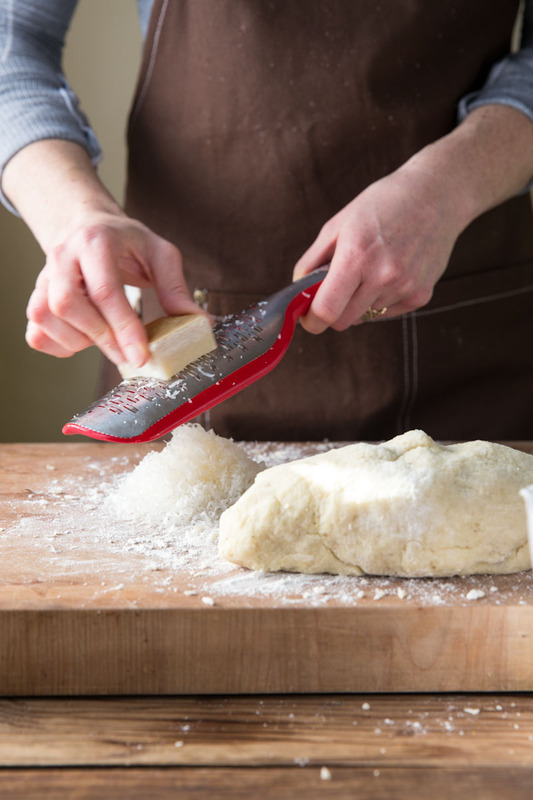 Use the back side of the fork to gently imprint the edge into each gnocchi pushing down then back. Set finished gnocchi on a lightly floured kitchen towel over a baking sheet. PS… My unprofessionalism easily bleeds through as you can see I photographed everything in my workout clothes! Ha! Well at least I had on a cute apron! I hope you find some inspiration to gather new or old friends around your table for a comforting bowl of gnocchi. 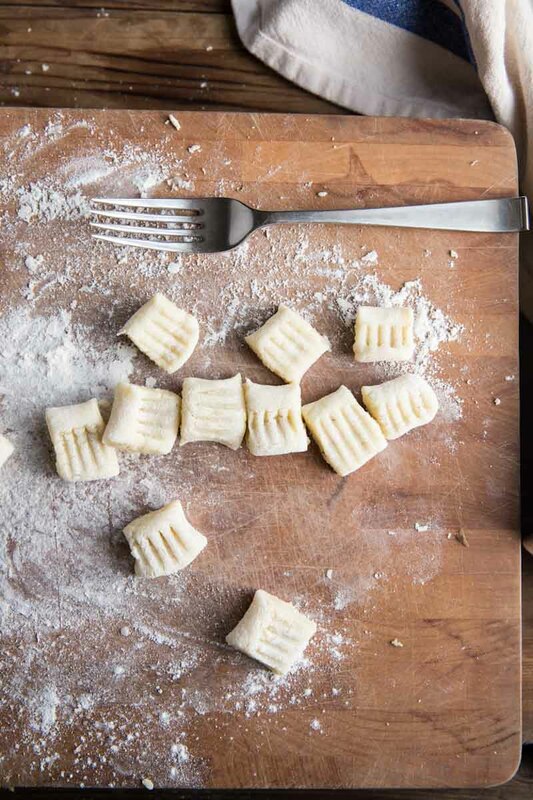 And if dinner parties tend to stress you out, gnocchi is just as good made days in advance and frozen until ready to cook, leaving you with the simplest of meals to prepare! Step by step instructions on how to prepare perfect homemade gnocchi. Wash the exterior of the potatoes and prick each one with a fork. 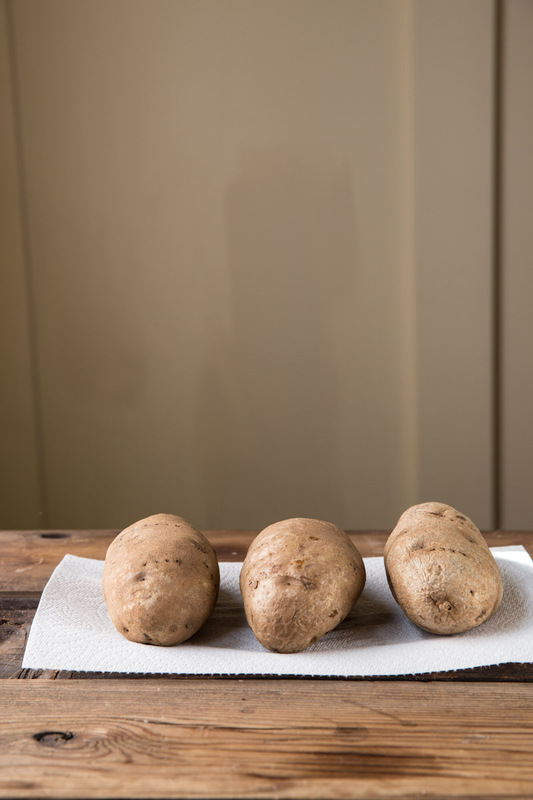 Wrap in foil then bake the potatoes in a preheated 400°F oven until tender, about 40 minutes. Let the potatoes cool enough to handle, then use a spoon to carve out the potato from the skin. Try and get as much of the potato from the skin as possible. Press the peeled potatoes through a ricer or a cheese grater then let them cool completely. 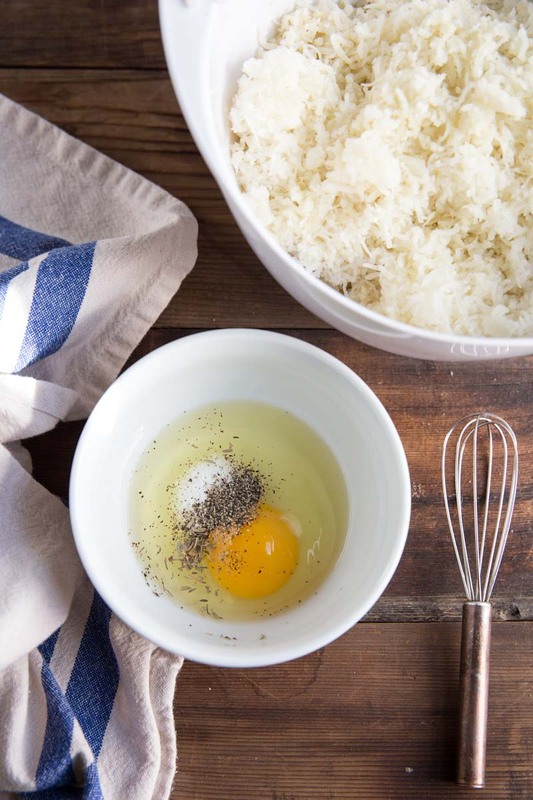 In a small bowl, whisk the egg, salt, pepper, and herb of choice together. Gather the potatoes into a mound and form a well in the center. Pour the egg mixture into the well. Knead the potato and egg mixtures together with both hands, gradually adding the grated cheese and enough of the flour, about 1 1/2 cups, to form a smooth but slightly sticky dough. It should take no longer than 3 minutes to work the flour into the potato mixture. Wash and dry your hands. 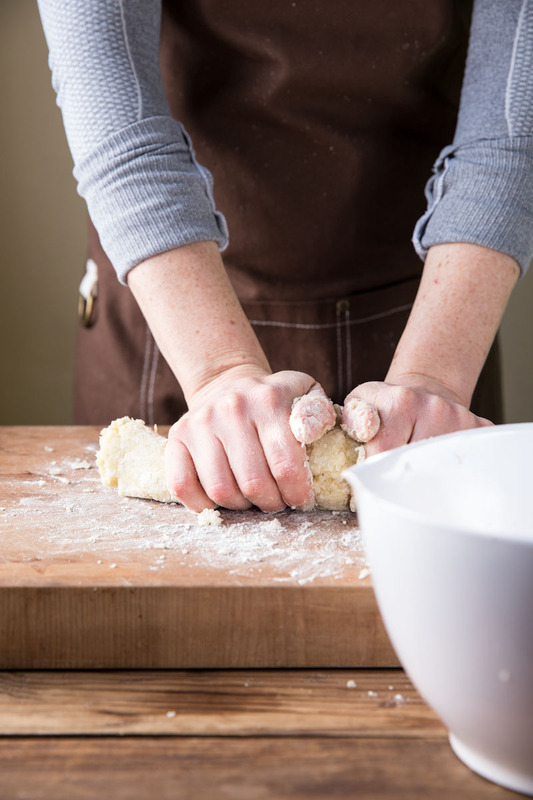 Dust the dough, your hands, and the work surface lightly with some of the remaining flour. Separate the dough into six equal pieces and set off to one side of the work surface. 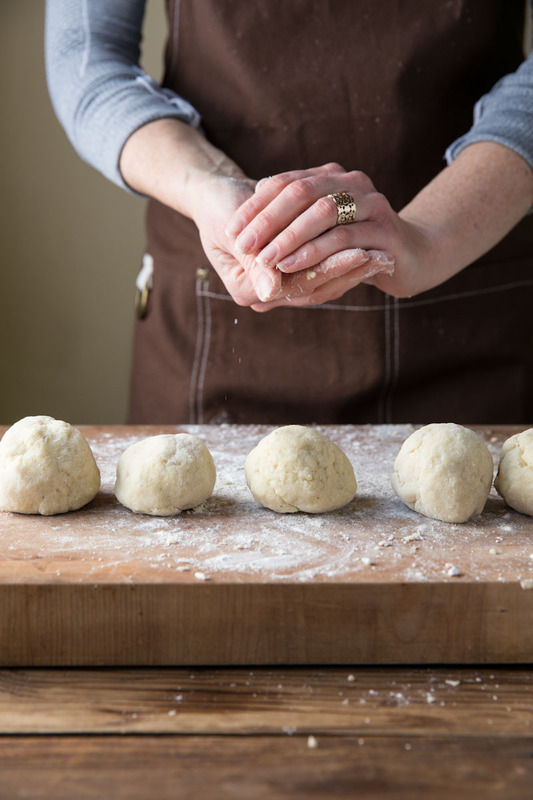 Place one ball of dough in front of you and roll the dough into a rope 1/2 inch thick, flouring the dough if necessary as you roll to keep it from sticking. Slice the ropes into 1/2-inch-thick rounds. Sprinkle the rounds lightly with flour then use a form to gently press the back side of the tines of the fork into each round. 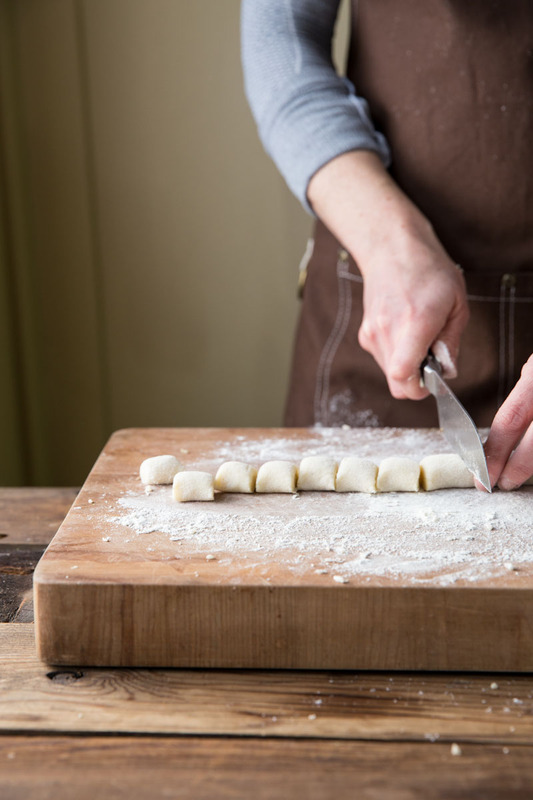 Set on a baking sheet lined with a floured kitchen towel and continue forming gnocchi from the remaining dough balls. Repeat the whole process with the remaining pieces of dough. At this point the gnocchi must be cooked immediately or frozen. Bring six quarts of salted water to a vigorous boil in a large pot over high heat. Drop about half the gnocchi into the boiling water a few at a time, stirring gently and continuously with a wooden spoon. Cook the gnocchi, until tender, about 1 minute (they are ready when they rise to the surface of the water). Use a slotted spoon to remove the gnocchi from the hot water to a separate serving platter. Cook the remaining gnocchi, if necessary. When all the gnocchi are cooked, pour warmed sauce over the top (use some of the cooking water from the gnocchi if your sauce seems too thick. 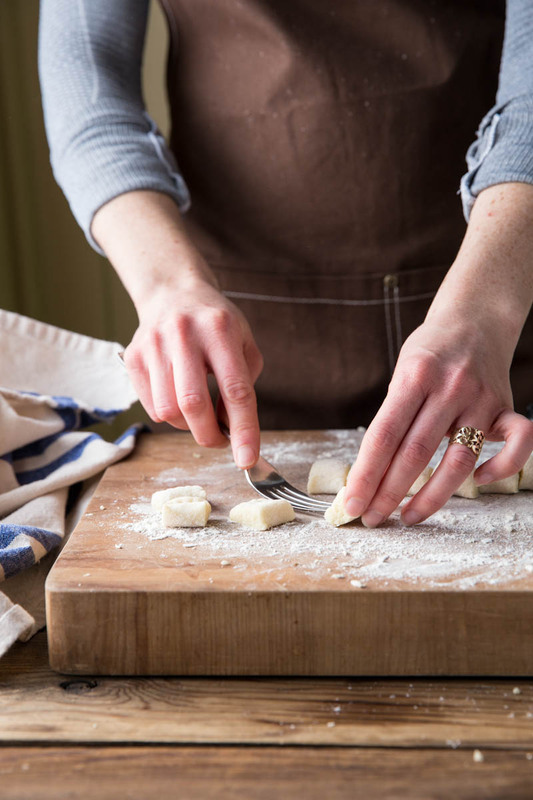 Yes, just hop on a plane and I’ll have tons of gnocchi ready for you when you get here. I was just talking to someone today about gnocchi! This looks super good. So much work but probably worth it! Izzy, thanks so much for the reply! I hope you give it a try and I look forward to hearing back if you do! 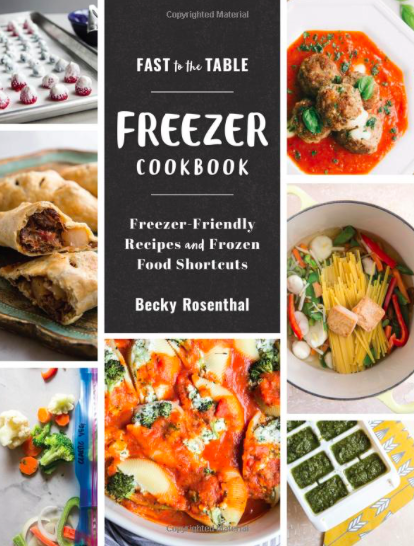 I am so excited for this recipe!! And these photos – heavenly.